Adding massively subsidised and chaotically delivered wind and solar to a power grid is guaranteed to send power prices through the roof (see above). Witness a little economic backwater called South Australia which – due to a maniacal obsession with sunshine and breezes – suffers the highest retail power prices in the world, routine load shedding and mass blackouts. SA is now synonymous with unhinged, ideological renewable energy zealotry. Part of the reason for the rocketing power prices in SA, was the destruction of its reliable Port Augusta coal-fired power plant, which was dynamited last year, to squeals of delight from its deluded Premier, Jay Weatherill. Renewables rent seekers and those that spruik for them have lately taken to running a line that coal-fired power is both unreliable and expensive. Yes, they either believe it, or they need to, because their subsidy-soaked existence depends upon it. Meanwhile, back on Earth, the quantitative aspects of market economics are both simple and brutal: remove a coal-fired power plant (capable of delivering power 24 x 365, whatever the weather) from the system, and power prices are bound to jump northwards. Here’s JoNova bringing us all back to reality. Last year one of our largest coal power plants suddenly closed, with only five months warning, catching the market by surprise and taking out 5% of our cheapest generation. (This kind of improbable anti-free-market feat shows just how screwed our national market is). 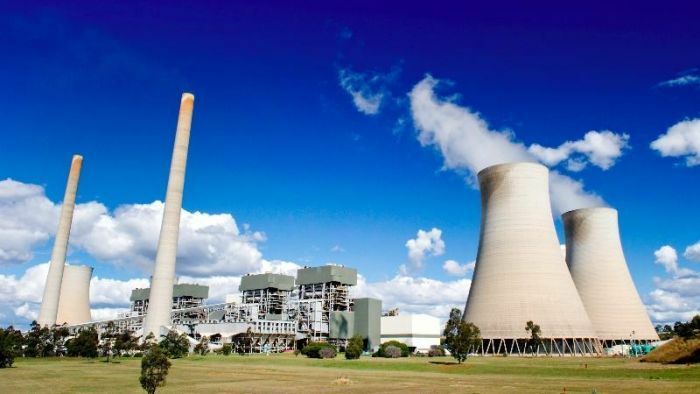 The Australian Energy Regulator (AER) has looked at the effect the closure of Hazelwood had on electricity prices and concluded that closing cheap brown-coal plants and replacing them with black coal and gas will make electricity prices rise. This will come as no surprise to anyone who can count to 100. A year on from the closure of the 1600 megawatt-sized plant in the Latrobe Valley, the report from the Australian Energy Regulator found wholesale prices in Victoria were up 85 per cent on 2016. Because electricity retailers use hedging for wholesale prices, the rise in retail prices is still feeding through. In the wash, the wholesale increase is expected to add 16% to retail prices this financial year compared to last year. After that, through some miracle, the AEMC expects prices to come back down from Exorbitant to Slightly Lower Than Exorbitant in the next two years thanks to an increase in renewables. In addition, the commodity price of both black coal and gas jumped — in part surely due to the extra demand for these to replace the brown coal that would have been burned — and prices became, not just a bit higher, but a lot higher. We can blame those commodity prices but if we’d had the flexibility to use cheap brown coal instead, who cares? Whole flows changed: Victoria used to be a powerhouse, but stopped being a net exporter of electricity and started to be a net importer. Luckily, South Australia produced so much wind power it became a net exporter of electricity for the first time in years. Yet somehow, despite that gift of all this “free” and subsidized wind electricity, prices still went up. Go figure. The signs are not good that there is some loophole or tweak that will fix this mess. Ominously, the AER did not find much volatility in pricing. The high averages were not due to freak high spikes, but were caused by relentlessly higher averages. 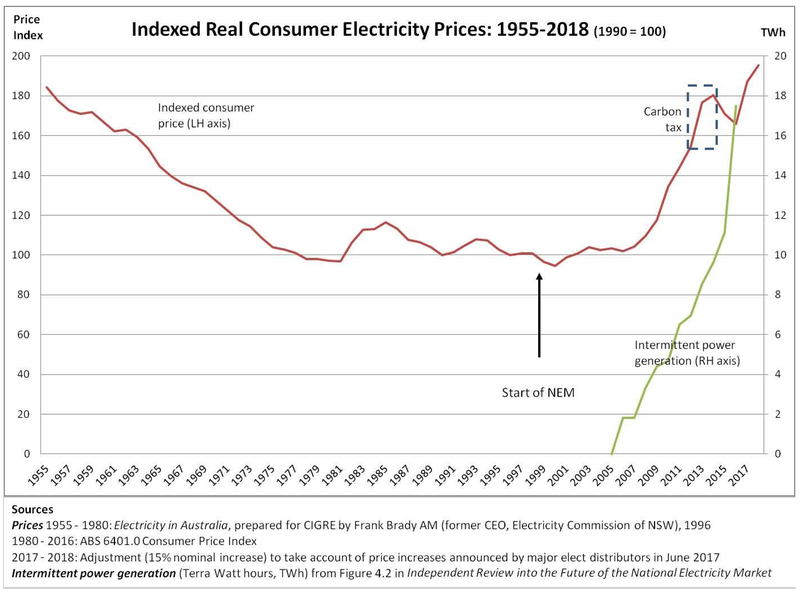 Also ominously, even though the states pay separate rates, the interconnectors “worked so well”, that losing a cheap plant in Victoria affected the price in all the states. Queenslanders paid more because of choices made by distant people they didn’t elect. In this conglomerate market influenced by five state and one federal government the incentives fold like an origami wallet. Naturally, if any state was free to dump the RET and stop the market-destroying effect of the renewables subsidies, investors might be able to inject some cheap energy back into the grid. At the moment, the screaming Banshee price signals that call for cheap generators have been sealed in bureaucratic bunkers. On the upside, the ABC reports that the closure of Hazelwood has “slashed” a piddling 4.1 mT of carbon “pollution” which might otherwise have improved our crop yields. At a cost of billions, this will keep the world 0.00 degrees cooler. Victoria, which now doesn’t profit from exporting electricity, cannot profit from increasing gas exports at the new higher gas prices either. Victorian gas fields are running out and the government has banned people from exploring for new ones. In a separate report, the Australian Energy Market Operator (AEMO) predicts there will be a shortfall of gas in Victoria, due to the depletion of offshore gas fields in Gippsland and Port Campbell. AEMO expects the state’s gas production to decline from 435 petajoules in 2017 to 187 petajoules in 2022, resulting in a shortfall of 19 petajoules for that year. Victoria is thus, the new “crash-test-dummy” of renewable-government. The problem isn’t that complicated — less of the cheap stuff means more of the expensive stuff. The increased output of gas and black coal fired generators coincided with increased fuel costs for some of these generators. As highlighted in our NSW report11 , NSW generators’ black coal costs increased from late 2016, particularly under short term contracts. NSW coal fired generators were also facing problems with coal supply during 2017, which drove higher offers from these generators. At the same time, there have been increases in gas prices in recent years affecting gas-fired generators. Our review also found that brown coal plant set the electricity spot price in Victoria far less often following the closure of the Hazelwood power station. Higher fuel cost generators set the price more often, in particular gas fired and hydro generation, while NSW and Queensland black coal generation continued to set the price a significant proportion of the time, but at much higher prices. Our key finding therefore is that the exit of Hazelwood removed a significant low fuel cost generator which was largely replaced by higher cost black coal and gas plant – at a time when the input costs of black coal and gas plant were increasing. These factors in turn drove significant increases in wholesale electricity prices. Annual average wholesale electricity prices in Victoria in 2017 were the highest they have been since the commencement of the NEM. South Australian average prices were also consistently high. Graph, AER, Electricity prices, set by gas, black coal, hydro in 2018. After Hazelwood (see the lighter columns) Australians had to rely on a different form of generation to set the price. Ownership in the South Australian and Victorian markets is concentrated, with a few, largely vertically integrated participants controlling a significant proportion of capacity. The AER did not find evidence that the players were gaming the system much or doing “opportunistic” bidding or withholding generation. But there was less bidding at under $50/MWh, and more bidding at $90-$100. In the past it was spikes of high wholesale prices that drove averages up, this time there was less volatility, and more just plain old constant high prices. I don’t think this can be fixed any other way than the utterly obvious. In the five years prior to Hazelwood closing there has been around 5000 MW of capacity withdrawn from the NEM, 3500 MW of which was coal generation. In NSW around 1900 MW was withdrawn mainly due to Wallerawang and Munmorah power stations (1600 MW combined capacity). In South Australia the Northern and Playford B power stations exited (740 MW combined capacity), while in Victoria Energy Brix and Anglesea (355 MW combined capacity). Over the same period there has been around 2500 MW of new capacity added to the NEM, 2100 MW of wind and 240 MW of solar. Around 1600 MW of this wind capacity is in Victoria and South Australia along with a 100 MW battery. The capacity factor for wind is about 30% and for solar is about 20ish percent, meaning the real capacity added was more like 600MW, plus or minus 2000MW. Curiously, about 750MW of previously uneconomic withdrawn power, which was mostly gas plants, made a comeback. Look at these interesting graphs: What’s the cost of brown coal, black coal and gas power? It’s difficult to say exactly what generation costs, but these graphs show the amount of time these different power sources were setting the price and what that price was. Worth an eyeball. Hazelwood closed at the end of Q1 2017. Prior to that, note the incredibly cheap winning bids from dirty, brown, outdated coal, which has “no future” (in a market controlled by the tooth fairy). AER Graph, 2018, prices set by black coal power. Bayswater coal plant used to be able to win bids at $40/MWh (or it used to have to bid that low to win). Thanks to the RET (Renewable Energy Target) destroying some of the cheapest power, that’s not happening any more. Costs are up and competition is down. AER Graph, 2018, prices set by brown coal power. One gas plant. Not cheap to start. Not cheap to finish. AER Graph, 2018, prices set by gas power. Unreliable wind and solar must be backed up by something and cheap brown coal is punished by pagan aims to control the weather. Thus it is inevitable that the more wind and solar we add, the more we need gas, black coal or hydro, code for “expensive”. The AER report also noted that Victoria and SA have only three big “vertically integrated” players. That’s another story, but with convoluted incentives we can be sure all three are taking advantage of the perversity on offer.